Your quest to find the superior quality paddle board is over! Now you can own one of the most popular paddle boards on the market. The Isle Peak board has been designed with an adventurous person in mind with it’s flashy color and quality construction. There are numerous color choices available when you purchase this board. These colors include Aqua, blue, red and white. Read the entire review to get familiar with what this board can offer you on your next fun adventure. Measurement and weight: It has a measurement of 10’ x 31”x 6”. The weight is about 23 lbs and it can easily support riders weighing up to 300l bs. This board could serve two smaller adults as well. Durability at its best: It is quite durable as it is created using the military grade PVC material. It has a thickness of about 6” which is far more than others. This soft but ridged construction will do away with scrapes, dings and dents that occur on hard board surfaces. Paddle adjustment: The paddle that comes with this board can easily be adjusted from 65” to 86”. You will notice that the paddle can be adjusted by pushing the button into the pre-drilled holes that are about two inches apart. It can accommodate tall and short people by the push of a button. The soft handle gives the paddler hours of comfort while enjoying their day on the water. Accessories available: The Isle Peak comes with many accessories such as a pressure pump, coil leash, backpack and paddle. Additionally, it has a removable fin and a repair kit as well. The D-rings and the straps can be quite useful in holding extra cargo on the board. You can also tie your paddle board to a dock or boat using the straps. This is a lightweight board and is designed for fun in the sun by people having varying skills levels. It also has a non-slip grip deck that ensures your safety during the ride. This board has an exclusive nose handle mounted on the front of the board for easy transport along the shore. The deck is designed with a diamond groove traction texture that serves as a safety feature as well as giving a stylish look to the board. One of the most useful features is the 6 point bungee system that is used for securing your gear to your board. Most other boards come with only 4 d-rings for this use. Portability is not going to be an issue when you decide to go with the Isle Peak. It is not a problem to store this paddle board because you can deflate and roll it up in minutes. The carrying case is attractive and the deflated paddle board fits in it nicely. Installing the fin is a fairly easy job. Initially you will find it hard to put the fin on but just slide the fin into the groove. Make sure that you use the latch at the back to secure the fin. To top it all you can easily use it with a kayak seat. The seat does not come with the kit but they can be purchased at any sporting goods store.This allows you to take a little breather during the hot day on the water. You can leave the board inflated, especially if you are in the habit of storing it indoors and will be using it often. This doesn’t harm the board in any way. Easy to operate and has many accessories. Great design and flashy color. Handles up to 300 lbs. of weight. When you use the pump for inflating it takes the gauge a bit of time to start registering the PSI. 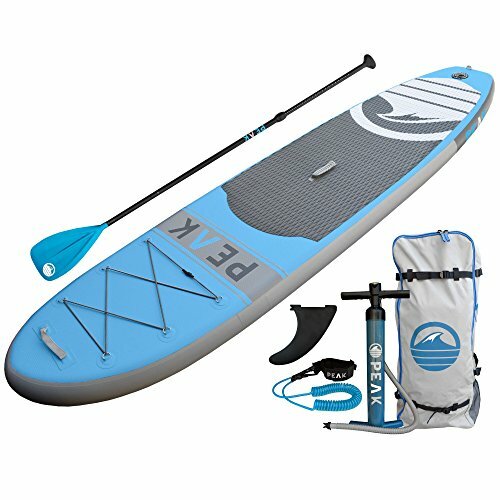 This ISLE Peak Inflatable paddle board is one of the popular choices on Amazon. You can get it for a great discounted price on Amazon. This will be a great investment for yourself or family to enjoy for a very long time. It has a nice carrying bag and inflatable pump that make it simple to inflate. Click Here to check the best price on Amazon. You can find more information on my paddle board guide if you are looking for something different.